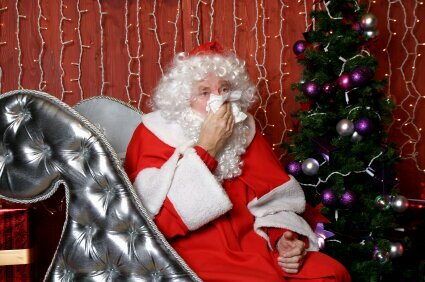 The Holidays are fast approaching, and it’s that time of year again… my sneezing, itchy eyes, and runny nose are in full effect. From the burning of artificially scented candles to the smell of real Christmas trees, I feel like my sinuses are being assaulted at every turn. I have suffered from allergies and asthma since I was a little girl, and the holidays have always been a difficult time of year for me. If you add seasonal colds and flu to my allergies and asthma, it adds up to headaches and chronic fatigue, not to mention a constant feeling of stress. If a live evergreen tree is a tradition you cannot live without, the following tips should help make this year’s tree a treasure rather than trouble. Wipe the trunk thoroughly with a solution of luke warm water and diluted bleach (1 part bleach to 20 parts water) to eliminate any mold. Some evergreens, particularly junipers and cedar, may be pollinating even in winter look for a yellowish tinge on the trunk and needles. Before bringing the tree inside, use a leaf blower (in a well-ventilated area away from the house or garage) to remove visible pollen grains. We steer clear of spray-on snow and pine scented oils that some families use to make their artificial tree more life-like, as they can trigger asthma and allergies for many sufferers. We avoid holiday flower arrangements and all artificial scents. If I want my house to smell like cookies, we bake homemade, all natural chocolate chip cookies, rather than burning a scented candle or potpourri. I avoid outdoor activities that may include a bon fire – no roasting marshmallows for me! Of course, I try to get plenty of rest, exercise, and take a multi-vitamin to keep my immune system in the best shape possible. Being so vigilant about my allergies and asthma leaves me feeling like I’m missing out on the joys of the season, so this year I’m asking Santa for something different. I’m giving BAX 3000 Neurological Stress Reduction Therapy by BioVeda Technologies a try. I’m hoping next Christmas I’ll be thinking about the sights, sounds, and scents of the season rather than the allergies, asthma, and headaches they bring with them! Why not give yourself or your loved one the gift of wellness this season? Contact BioVeda today!